I finally finished this! I often find pick-up and overshot patterns too tedious and still love the act of plain-jane tabby the best...but IT'S SO PRETTY. I hand dyed the dishcloth cotton that was used for the pattern threads with short colour changes, using those sponge brushes. 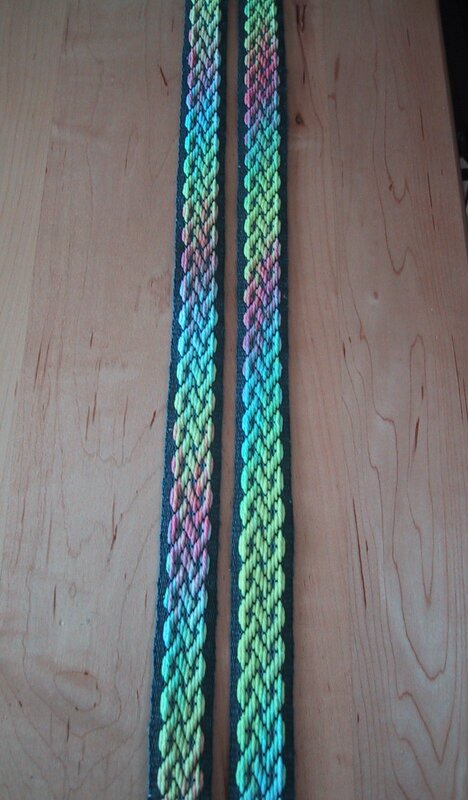 Then I lined up the colours as best I could on my inkle loom. There is always a little ikat-like push and pull because of the way the string heddles influence the yarn. On a separate note, I've found that if I do horizontal bar pattern using variegated for one stripe and solid for the other I get a comparatively smooth-looking transition. So if you have a pick-up pattern that calls for the horizontal bar structure as a base, variegated can be ultra sharp. If anyone is curious about my technique for hand painting my cotton for inkles, just buzz me a note and I will set up a little picture tutorial! I've been busy prepping for a weekend workshop on basic inkle weaving. It's going to be so much fun! I love teaching, and sharing in creativity with other people! I hope one day soon to have a large studio space on an acreage outside the city, where I can host retreats for all kinds of wonderful fiber related adventures. It's been my dream since I graduated from ACAD, and it might be within my reach sooner than I ever imagined! Ok, just to make sure I didn't miss something before, I read back posts to see if you made some kind of announcement prior to now and didn't see anything. So, congratulations are in order I take it? I've been having trouble getting much work done between the morning sickness and the feeling of exhaustion I had for the first 3 months, but I think my energy levels back to normal. 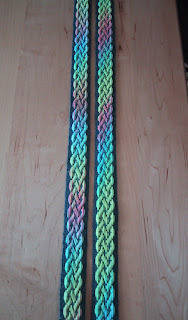 I've just started inkle weaving.. would you be willing to share the pattern for this? It's beautiful. I can see by some of your photos that we share a love of bold color. This is a beautiful pick-up band. I love the use of the variegated yarn. I agree with you that it is too time consuming. It could probably be set up as a card weaving pattern and be faster. I would LOVE to see if you could or have put together a tutorial on either or both of the techniques: both the pattern and the dye hand-painting technique. I want to get started in weaving and, while I'm having some medical setbacks (severe numbness in all of my fingertips), I still have plans to try moving forward. I want to learn most different kinds of weaving, especially the more involved kinds: frame weaving, inkle weaving, things that involve hands and simple tools rather than machines. Of course, with my current difficulties this becomes much more difficult, but I'm [usually] not a quitter (just an expert procrastinator). Please let me know what you have available or for sale regarding this piece. I absolutely adore it. I'll peruse your site some to look for contact information in the meantime.